I always pictured Ryan and I seeing in our anniversary in style, with champagne, a fancy dinner and lots of romance. But as midnight struck on 2nd April 2017 the most we could do to celebrate was to turn to each other and blurt out "Happy Anniversary" as I breathed through horrendous contractions. We had to wait a good few months to do something, once we had all settled into life as new parents and Eric was of an age where we felt confident he'd be alright being left for rather a long period of time. And Aussie Floyd coming to town gave us the best excuse. Deciding to make the evening really special, I made the suggestion that we headed to Gino's together. Ever since attending the press evening I was itching to return and sample more from the menu and investigate the prosecco bar properly. Because Floyd were starting at 8pm we decided to book a table for the late afternoon to make sure we had loads of time to spare to get down to the Echo Arena, and maybe have a pit stop for a cheeky glass of something on the way (nights off are rare nowadays and we wanted to make the most of it). We got to the restaurant with a few minutes to spare and were greeted by the staff front of house and asked if we would care to indulge in a complementary glass of fizz. Flutes in hand we made our way over to the bar, nestled down into some comfy chairs and waited to be taken to our table. Irregardless of how busy the dining space was, the bar was full of couples and groups of friends all sitting on bar stools, sipping drinks and enjoying themselves. And this was on a Sunday! Everybody seemed to be having a great time and we soaked in the atmosphere and just felt really happy. Phones firmly kept in pockets (aside from the occasional InstaStory update) this was the most Ryan and I had sat and actually talked to each other uninterrupted in ages. 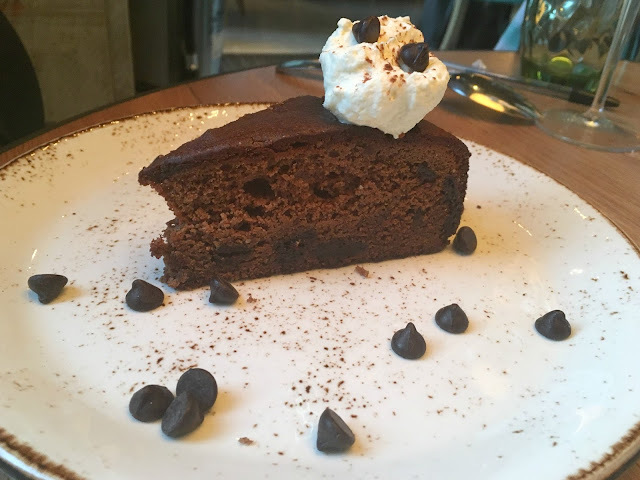 In no time, we were approached by a server and escorted over to our table, which was right at the edge of the dining space - private, and perfectly placed for people watching. Making the most of the precious few "grown up" hours we had we took our time in deciding what to eat, and although our waiter stopped by a few times to check on us, we didn't feel rushed. After a good few minutes catching up with each other and a couple more sips of our prosecco, we opened our menus and looked through the choice of dishes. Remembering the arancine starter from the press night I decided to go for these and Ryan opted for the king prawn bruschetta. 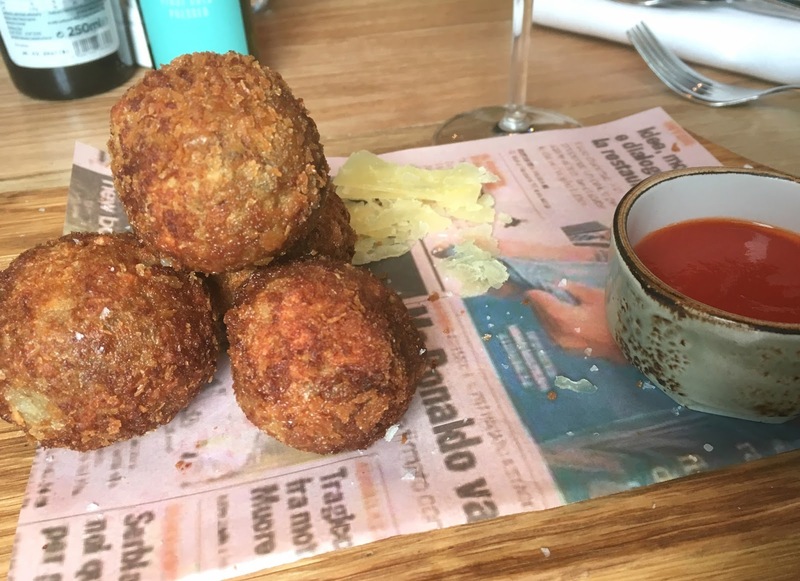 The perfect balance of bite in the crust and creamy filling, the arancine really hit the spot without being too filling, with the accompanying making a great companion to the dish - complementing it perfectly. And Ryan's starter went down just as well (I of course had to have a cheeky bite), with succulent prawns and a great choice of dipping sauce on the side. It was such a struggle trying to decide what to have for my main. There was just so much choice! 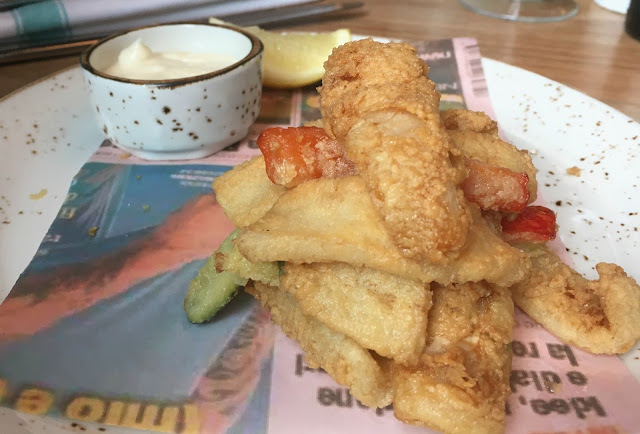 From cod to calzone and penne to pork belly, everything sounded delicious. Finally I settled for the veal meatballs, with Ryan choosing the sirloin steak. Again, it was great to see how good the portion sizes were. My plate was piled high with meatballs all covered in a thick and wholesome tomato sauce. It looked and smelt beautiful and really got my taste buds buzzing from the get-go. And they tasted just as amazing - that sauce was definitely one of the most delicious I have ever tried. Ryan's steak was cooked fantastically too (yes yes, I snuck in a bite) - with the knife sliding through it like butter to reveal a perfectly pink middle. Even though we were both comfortably full after our starter and main course there was no way we could leave without sampling something from the dessert menu. With a collection of indulgent puds from which to choose, I was instantly taken with the sound of the chocolate fondant. Ryan, also opting for something chocolately, went for the chestnut cake. 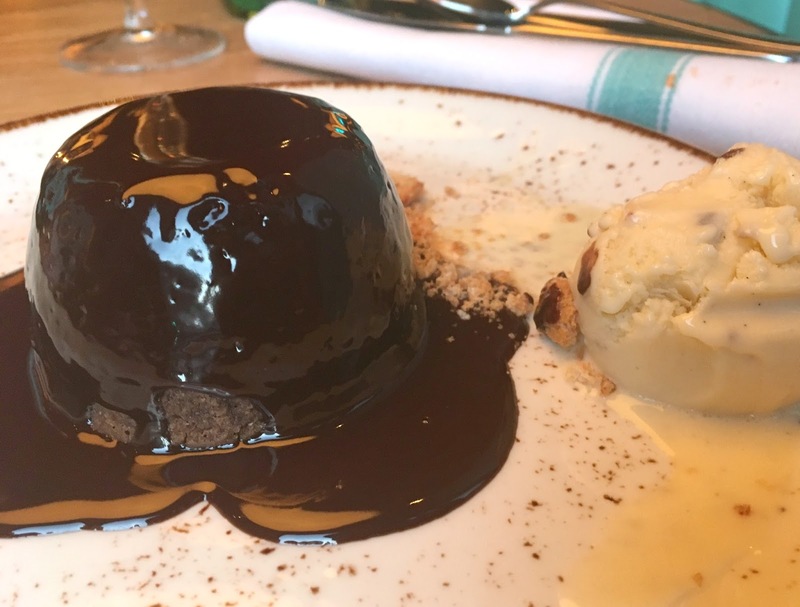 Covered in a thick layer of glistening sauce, the chocolate fondant was my idea of a dream dessert. It was rich without being sickly and incredibly flavourful. Although a good size, I think that had you decided to go for other dishes for your starter and main course, this might be a dessert you could not finish. Although Ryan polished off all of his chocolate chestnut cake he did express that he would have perfered mine. I don't think this was a reflection on the taste of the cake (although to me the idea of chestnuts in a dessert seemed a little bizarre) - we just both have a really good understanding of dishes that we really enjoy. What I liked a lot about Gino's My Restaurant is how it manages to balance a really sleek and classy interior with dishes that are unpretentious and comforting. 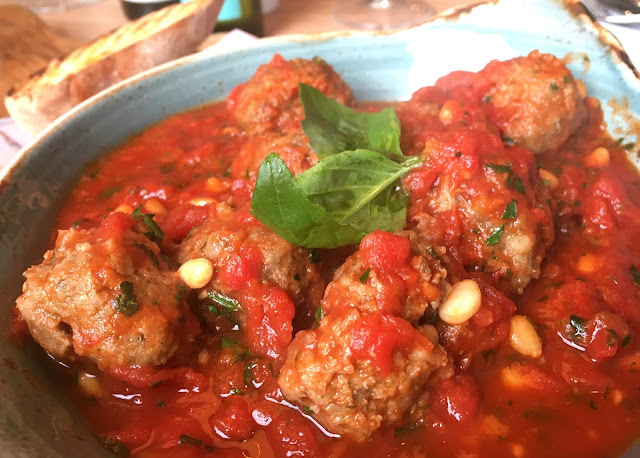 Everything on the menu is taken from one of Gino's own cookbooks so can be reproduced in the comfort of your own home too. All the dishes are all quite affordable too, meaning that you can tailor your own experience depending on what you are willing to spend. The bar also makes a mean cocktail. Ryan ordered a negroni whilst we were waiting for our table and he commented it was one of the best he had ever had. 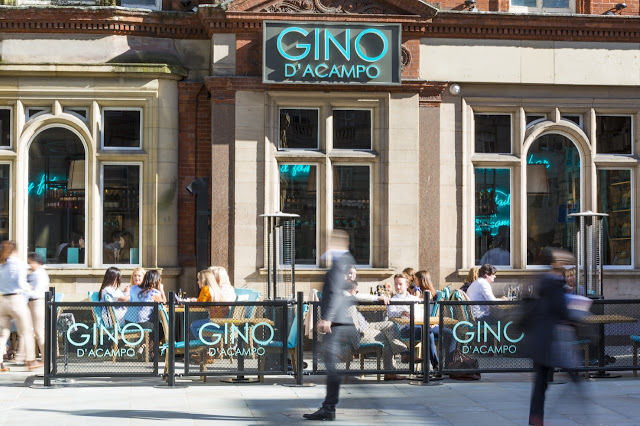 I still stand by what I said in my press night post - I think Gino D'Acampo has found a good niche with My Restaurant, and judging by how busy the place was when we went it is clear others think so too. I'm really glad we went back to experience it properly. The food was beautiful, the atmosphere electric, and the whole dining experience really enjoyable. 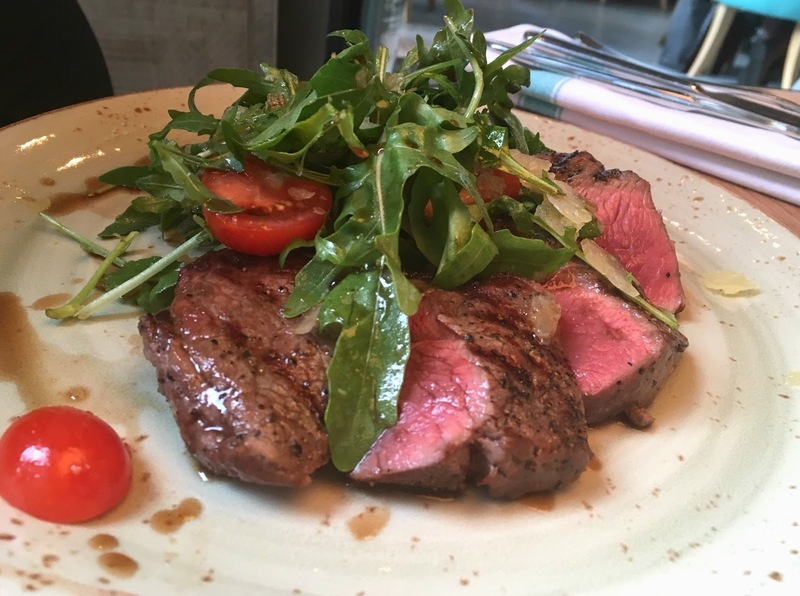 I love the fact that you could either pop in for a cheeky prosecco or sit down to a delcious meal. It's definitely a feature that will coax me back the next time I am in town. Have you visited Gino D'Acampo's My Restaurant yet? *We were kindly gifted a bottle of prosecco by Gino D'Acampo My Restaurant during our visit to the restaurant. Although very kind this does not affect my opinions. They are always 100% honest and guided by my own personal experiences.